One of the nice things about taking time off is the ability to spend a lot of time on things that you like to do but often don't have enough time to pursue. In my case, this means tennis (not worth blogging about, but funny to watch) and model boat building. I am just finishing off the cabin of the Yankee Hero as I write this. Although at times I feel like I am building a doll house, building the deck and the deck structures really gives a boat its character and imparts realness to a model. I always think building the deck furniture is going to be easy. It certainly seems it after you finish either carving or planking the hull. Many kits, including the Yankee Hero, have laser cut, tabbed pieces which just fit together. Having said that, the human eye forgives some errors in curvature. It doesn't make those same mistakes with right angles. And , in my opinion, non-modelers look more carefully at the deck and masts than they do at the hull. So it helps to be careful. Several tricks help. The most important is to use a block to help hold the pieces of wood as you glue them together. This keeps the corners straight. The second is to sand off any spare bits of wood on the pieces of wood. This also allows you to have a clean corner. I am a great believer in using several coats of paint, particularly for light colors such as white, and sanding with fine sandpaper between coats. Its a pain to do, but it has a much better appearance when completed. A good paint job can also be used to cover up some pretty ugly errors! Setting the cabin into the hull is always very exciting. Just make sure that the piece sits in the deck correctly before gluing it in. Sometimes you have to sand or cut part of the deck or bulkhead to make sure the cabin sits true. 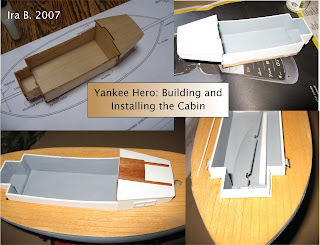 The Yankee Hero kit has a well designed cabin that is reasonably easy to make. My only criticism is that they could have supplied a few more strips of 3/32" x 3/32" basswood. 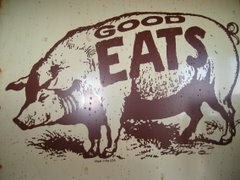 It needs to be rounded to make molding (see photo). Its easy to screw this up, and they don't give you much extra. They should.